First of all, thank you everyone for your wonderful wishes. I am excited to report back that we had an awesome day. I have to admit taking a day off to celebrate the anniversary was a great idea as we were able to stay in bed till 9 am. I was awake before 7 am but it was nice not to worry about the time and spend more time in bed in the cold winter morning. I just cuddled with AS on the bed. It was even nicer when AS gave me a nice and sweet card. I loved what he wrote on it and you can say I was touched. As you can see my AS is a man of few words but when he writes, he makes it count :). I just loved it. I can see that as the years have passed, we became more compatible and stronger as a couple. We know each other better and we know what to do to please each other. We fight less and get annoyed less. If we fight, it doesn’t last long like before and we both understand each other a lot better. I have to give most of the credit to AS for sure. He brings out the best in me every day. We had a lazy breakfast and decided to go out for lunch. 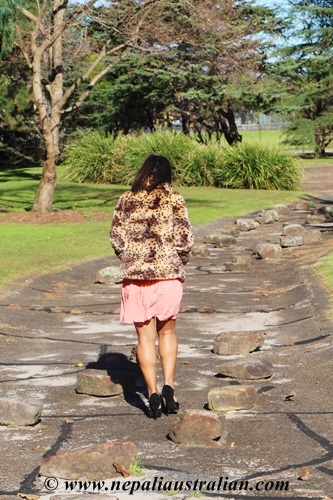 Before that, we stopped at a park and spent some time there. It was a windy afternoon but we still had fun in the sun. Thai was on the menu for lunch and it was nice and filling. I was again thankful that we had a day off as we did not need to rush. We took our time, enjoyed the food and went home to change. 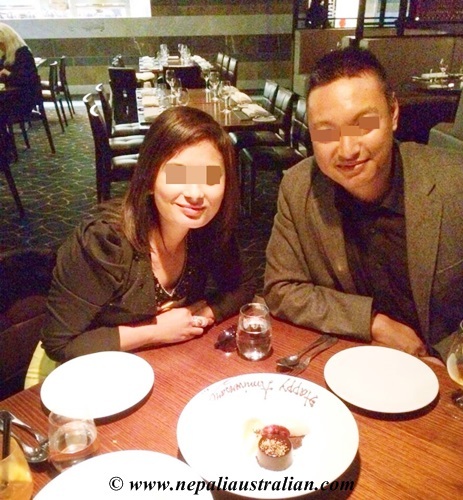 We had dinner reservation at the restaurant called Black by ezard. 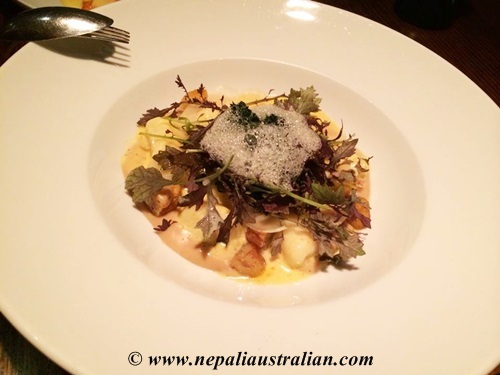 Black by ezard is by Melbourne chef Teage Ezard, at The Star casino. 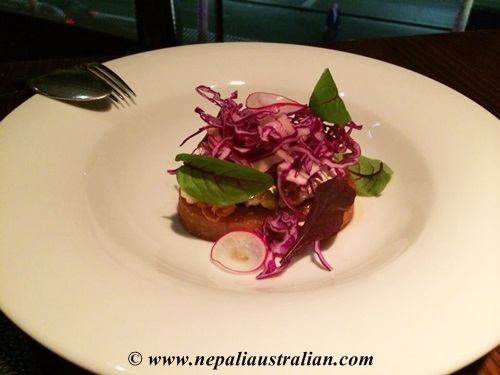 Ezard is the creative force behind the two hat restaurant ezard and Asian street food diner Gingerboy. 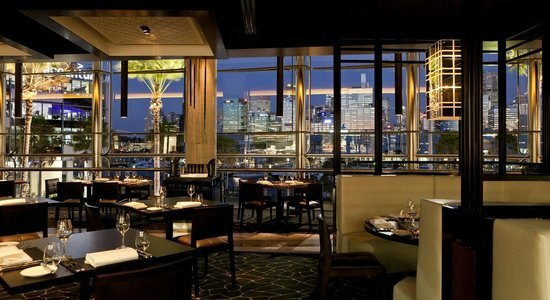 The venue is cool and slick, a mix of elegant booth seating and leather upholstered seats, fronted by floor-to-ceiling glass windows that look onto Pyrmont Bay. We were given a table with a window view. We could see the beautiful Sydney city in evening light. We ordered drinks first. I had ORANGE – Angostura Bitters, Passionfruit, Carbonated Natural Spring Water mocktail and AS had a beer, Lord Nelson Three Sheets. 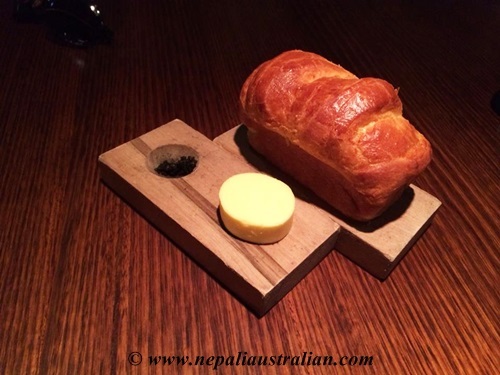 Before our drink, we were served complimentary brioche with butter and volcanic black salt. It was just delicious with chunks of the warm, buttery bun and inky black sea salt. My mocktail came shortly with AS’ beer and we both were happy with our choices. When faced with a dilemma over what to order, the best thing to do is share. So AS and I decided that we are going for three-course meal but would share all the dishes and it was a good decision. 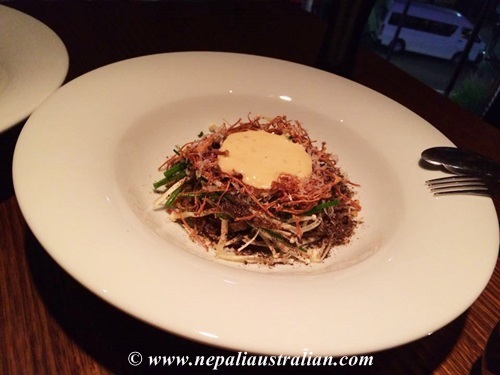 We stared with mushrooms; a warm salad of exotic mushrooms, rocket leaves, brioche crumbs, parmesan and pork hock, crisp fried, nashi pear, radish, yuzu and green chilli caramel. To my surprise I loved the mushroom more than pork. It was so tasty and full of flavour. Also the portion size was really good for up class restaurants like this. It was followed by gnocchi, handmade potato, roasted chestnuts, black cabbage and ocean trout with crispy skin, cauliflower, heirloom carrot, caper and lemon sauce for main. 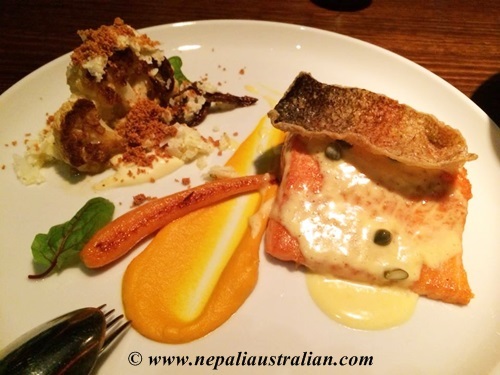 The ocean trout looked and tasted great with lots of fanciful accompaniments. Gnocchi was very enjoyable with black cabbage. By this point, I was stuffed – I was wondering why I had decided on a three course meal as there was more to come. Of course, I can never skip chocolate dessert when I am with AS so we had chocolate caramel and chocolate custard, peanut butter mouse, wood grilled banana sorbet as well as lemon olive oil and lemon cake, lemon curd, poppy seed cream, frozen yogurt. 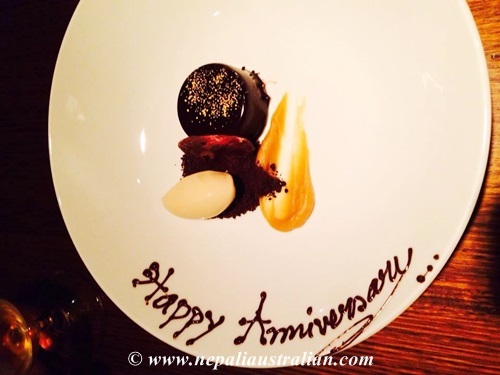 We had mentioned that it was our anniversary during the reservation and we were happy that they remembered this and so in a wonderful show of hospitality, our dessert plates had ‘Happy Anniversary’ piped in melted chocolate. Desserts tasted wonderful, super rich chocolate and peanut butter mouse and the lemon cake was surprising yummy in every bite. I only left some poppy seed cream behind because I was going to explode if I had another mouthful. The service, while quite good for a restaurant in general, falls somewhat short of hatted service. 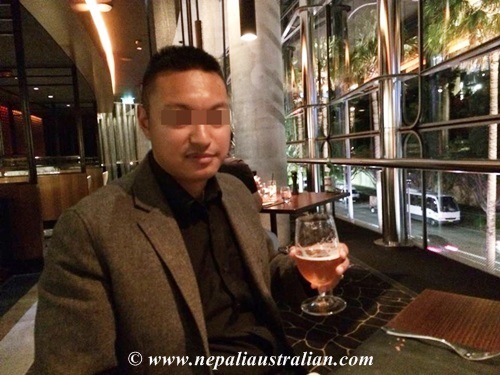 Overall, I found Black by ezard an amazing dining experience that is everything you would want and expect from a restaurant of this level with impeccable service. Both of us were happy when we left the restaurant. After that we went to The Star casino for some fun. It was such a perfect day for us with amazing food and lovely company. 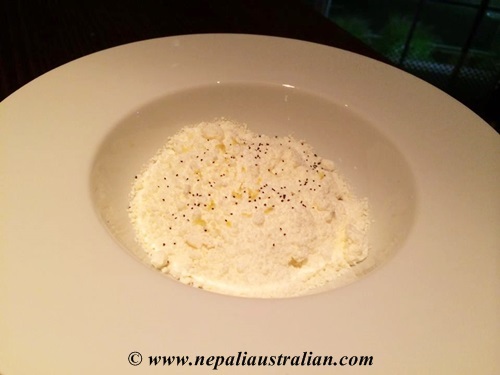 This entry was posted in Marriage, Personal, Relationship and tagged anniversary, Anniversary celebration, australian, crisp fried, Downton Abbey, Ezard, frozen yogur, Gnocchi, green chilli caramel, lemon curd, lemon olive oil and lemon cake, M from nepaliaustralian, nashi pear, nepali australian, Nepali blog, Nepaliaustralian, poppy seed cream, pork hock, Radish, Teage Ezard, The Black, The Black by Ezard, The Star casino, yuzu. Bookmark the permalink. as always a sweet post. may god always bless u with happiness with each other. Awww this is sweet! Congrats for another year ! Both of you are perfect couple. Wow that’s a short but sweetest love note from ur hubby. All the food looks so yum. Great way to celebrate an anniversary. Hi! Looks like a fantastic place to eat! My favorites would have been the bread and the dessert! Our anniversary was the week before! Have a nice day! sounds like an amazing, relaxing day for you guys 🙂 those desserts are calling me..